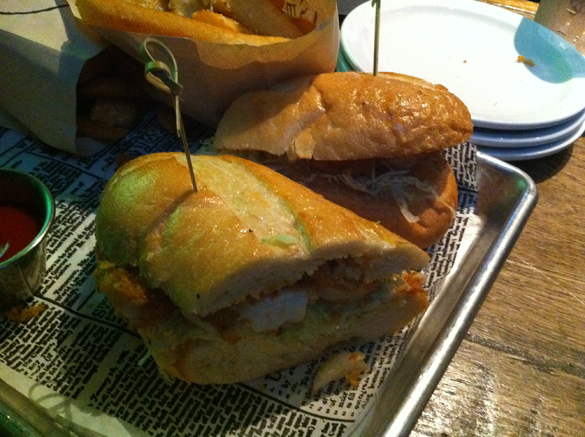 Some time ago, I ordered a “Shrimp Po’ Girl” from an establishment in Santa Cruz. The sandwich was a veritable monstrosity, featuring such an abundance of shrimp that the enterprise was a sort of riddle of consumption. I gave the shrimp sandwich another shot at the upscale bar and grill The Smith House in a strange area of Los Angeles referred to as “Century City.” The presentation of this shrimp po’boy was a far cry from my previous experience, and indeed it was perhaps a third of the amount of shrimp for right around the same price, if not more (forgive me, but this was some time ago, and the specifics escape me). And therein lay the problem with this sandwich experience, if indeed there was one. The shrimp and the sauce both had ample flavor, and the bread was the perfect complement. It was an enjoyable sandwich experience, but I was left wanting more. The coverage of shrimp throughout the sandwich was a bit lacking, as there were entire bites devoid of the main ingredient, leaving me chewing a fine lettuce-sauce-and-bread combination, but falling short of the potential. I am happy to chalk this up to a careless line cook, but should I order it a second time and again find a severe lack of the selling point…well then, shame on me. This entry was posted in Sandwich Reviews and tagged Los Angeles, Reviews by Bill, Sandwiches I Have Eaten, Sandwiches Made For Me by bengrimm. Bookmark the permalink.